Eddie Ross is the Co-founder and Chief Content Creator of Maximalist Studios, specializing in environmental photography for the home design and consumer products industries. He has worked as a design, decorating and food editor for Better Homes & Gardens, Food Network, Martha Stewart Living and House Beautiful. Recognized by design aficionados for his inventive, out-of-the-box approach to decorating and entertaining, Eddie consistently re-imagines the aesthetic possibilities in secondhand finds, imbuing them with a chic and colorful sophistication within everyone’s reach. 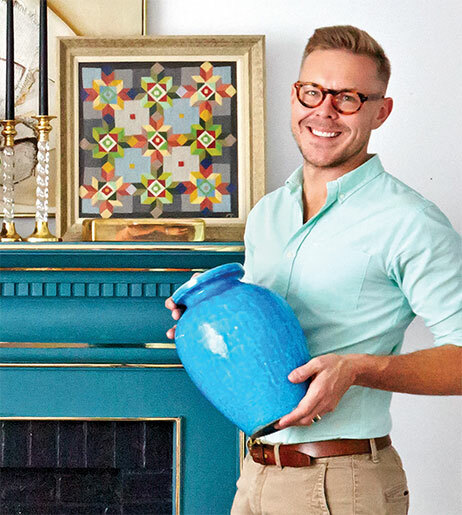 His sold-out tours of antique markets across the country have empowered devoted followers to find the best things they can and, at the same time, to give new life to what they may already own. Eddie lectures widely on the living arts, from food and flowers, to gardening, decorating and entertaining. His first book, entitled Modern Mix: Curating Personal Style with Chic & Accessible Finds, was published by Gibbs Smith in September 2015.